I have chosen to go to the beach this morning to take photos for this special date and so this is my personal choice for the occasion. 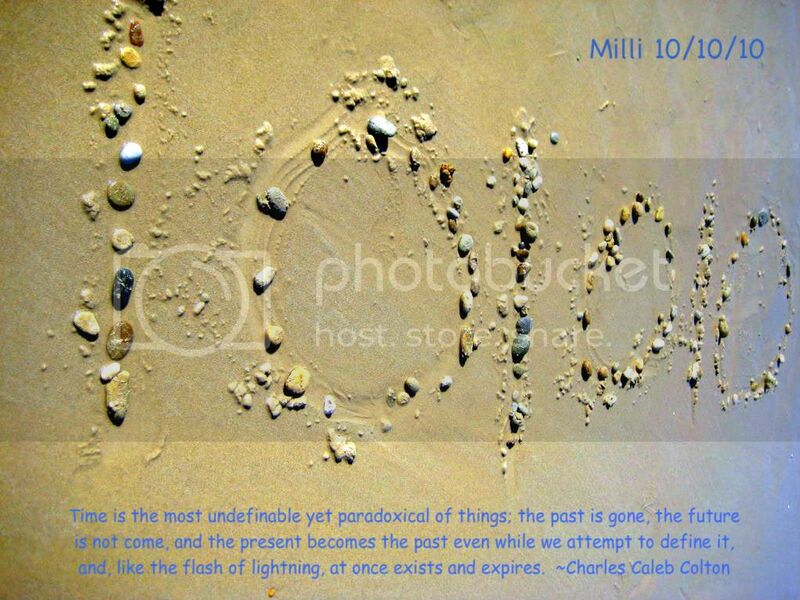 10/10/10 written on the shore line in the sand and embellished with pebbles, my photo represents the special moments in time a photo can capture and how fleeting these moments can be, because the tide like the time will wait for no man. The moving tide washes this special date away in the next surge of water onto the shore. Every moment is a precious gift with it's own special reason in time. Thanks Lynda why don't you join us this week too? Anything it's all about where we are and what we are doing. Thank you. That is great! love the way you have the writing in the sand here too. Thanks for ur comment on mine dear. A moment in time captured for all eternity......Lives can truly be defined through photography. Fabulous quote...love the way he has defined time! Milli, what a wonderful shot, you are so talented. Have a great time away and take care! Wow, so very touching your words, very deep and true.. The photograph is most definitely one of a kind. I love your idea here.. It is wonderful. Thank you so much for sharing. ...the perfect place, your shells rock and so do the rocks lol! Such a lovely assortment of seashells. Everything is perfect on this entry... love the photo, the words, the pebbles and above all... the idea! I can only say that I'm jelous of you , cause its very cold here. A big thank you to all who have visited and to my friends yet to pass by. I am off up the river for a spot of fishing until friday. Take care and I'll be back I hope with a few good photos. Milli, this is awesome! The words are wonderful. Great shot. LOL I like this one as well as the one on the main page. The sand, tide and stones assembly, a product of your mind. The combination of both confirming your mental ability once again. Thank You Bill your comment was indeed a very pleasant reaction to my 10/10/10 attempt.